Southwest of the Gate of Heavenly Purity (Qianqing men) is the Gate of the Thriving Imperial Clan (Longzong men), an important security point from the Inner Court (nei ting) to the West Gardens (Xi yuan). In the narrow sense, West Gardens refer to the imperial gardens on the west side of the Forbidden City, as well as the gardens of the Imperial City including the North, Middle, and the South Lakes and their interesting sites. The West Gardens were damaged by the Eight Allies and after the Revolution of 1911 was divided and squatters moved in. In a broader sense, West Gardens can refer to all the imperial retreats to the west, i.e., the Summer Palace (Yihe yuan), and the Garden of Perfect Brightness (Yuanming yuan). The gate also led about one-hundred meters to the west to the gate is the Palace of Compassion and Tranquility (Cining gong), the residence of dowager empresses. 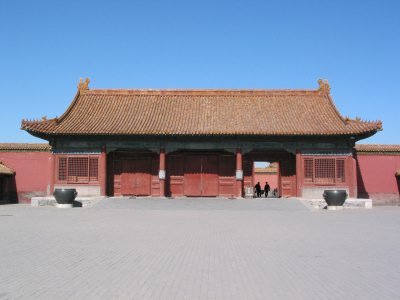 Even imperial kinsmen and high officials could not enter the gate into the Inner Court unless there was an emergency or unless they were requested for imperial audience. The Office of the Grand Council of State (Junji chu) was located just inside this gate. Coffins of the Qing emperors who died outside the Forbidden City were carried in through this gate where a mourning assembly was held. During the Jiaqing reign (1796-1820), a fierce fight between intruding rebel peasants and the imperial guardsmen took place at the gate in 1813. Guardsmen successfully blocked the rebel force's way into the Inner Court by shutting the doors. The half-arrow now stuck in the gate's name plaque is said to be an artifact of the confrontation.